The Grand Canal of Venice, Italy – The waterway that splits the grand city of Venice directly in half is what locals refer to as the Canalazzo, or Grand Canal. It is the most vital waterway within the city and is just over two miles long. A view of the city from above makes Venice look like a large fish, which is pretty neat for a city at the sea. From above, the Canalazzo resembles a large S shape, like a stripe down the side of the fish. On both sides of this large “S” are several historically-valued buildings that date from the 12th to 17th centuries. This city and its grand architecture testify to the richness of the Italian Republic. The Canalazzo has been the main center of trade in the region since the Middle Ages. Grand ships were known to sail through the canal, and when the ported, the travelers required places to eat and sleep, and thus Fondaci came to be. The Fondaci were a string of warehouses and hotels that housed the merchants arriving from all around the world. Connecting various places on the one side of Venice to the other side are four large bridges. Each of these bridges were built in a different era, the most recent of which is Constitution Bridge. This bridge is also called Calatrava, named after the Spaniard who drew the plans for the project. The bridge was opened in September of 2008. Linking Plaza Roma with Italiano Train Station, this bridge was much needed in regards to the number of travelers the region accommodates and the need for other, older bridges to have less traffic. 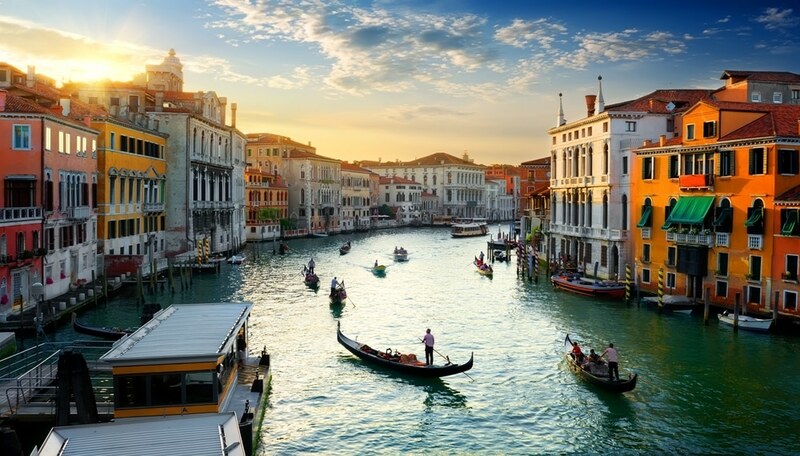 Visiting Venice is not complete without a gondola ride along the Canalazzo – The Grand Canal. The palaces along the canal are breathtaking to see, but note that there are no pedestrian walkways. These palaces were built and subsequently have been renovated by some of the most important families in Italian history. The only way to experience their grandeur is via a water bus tour. The Grand Canal of Venice makes for a romantic experience, or one to simply relax and enjoy the laid back nature of life.